The revolutionary Solvita Soil Life test brings you closer to your soil quality goals. How? By enabling you to measure something you've always wanted to know but couldn’t easily test for: soil biological respiration. The Solvita Systems was developed by scientists at the Woods End laboratory who have been testing soils for over 20 years. The procedure employs a sophisticated, patented colorimetric CO2-Gel technology in a safe and easy-to-use process. The result is a test that can be performed on-the-spot in the field or lab and doesn't require complicated computations to interpret the result. Image ©copyright 1997 WERL. Used for illustration only. 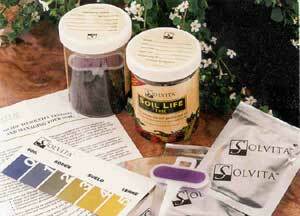 The Solvita Soil Life Test Kit is available as 3 or 18 test packages with refill kits also available. Solvita and Woods End are registered trademarks of Woods End Research Laboratory.